The footballer who mistakenly thanked his wife and girlfriend during his post- match interview has denied he's been unfaithful. "My family knows that I call my daughter my girlfriend. That's what I was talking about. I don't have a girlfriend," the Ghanaian striker said. 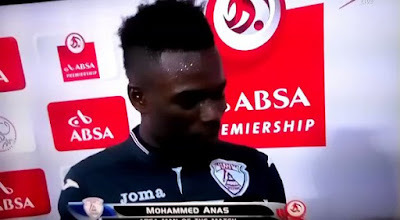 Anas who plays for South African team 'Free State Stars,' was named 'man of the match' after scoring two goals in the Star's draw against Ajax Cape Town. His post-match interview started innocuously enough when he thanked God and his fans, but things took a decidedly awkward turn when he suddenly blurted out: "Thank you for this, I appreciate my fans. My wife and girlfriend...I mean my wife, sorry to say," he quickly added. Viewers squirmed as Anas realized his blunder and started groveling to his wife: "I'm so sorry...I love you so much, I love you so much from my heart!" Anas has now spoken out and said he has nothing to worry about from his wife of seven years.